An award-winning show garden from the RHS Tatton Park Flower Show has been donated to Bromborough Pool Garden Centre, to encourage mindfulness and relaxation for Service Users and staff. Julie Dunn, who works at Trug Garden Designs, won the silver medal at the Flower Show for her ‘Sleep Well’ garden, which explores the themes of relaxation and revitalisation and was sparked from Julie’s scientific research around the health benefits of both sleep and being outdoors in green spaces. 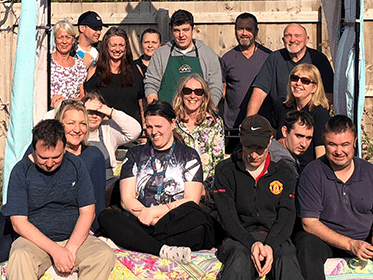 The garden, including the flowers and bed area, was donated to Bromborough Pool Garden Centre, which is owned and managed by Wirral-based charity Autism Together. Both Service Users and volunteers helped re-plant the ‘Sleep Well’ garden, with extra help from employees of the Royal Bank of Scotland, and the Bearded Villains, a group who often offer their support and time to help Autism Together. “When Julie offered to donate her award winning Show Garden from R.H.S Tatton I was delighted. It has been the perfect addition to our Service User’s area. Julie spent £3000 funding the garden, and had to meet strict criteria to be selected for the RHS Tatton Show, which is the only RHS show outside of London.